Believe it, we hit direct numbers continuously over the past 3 draws. 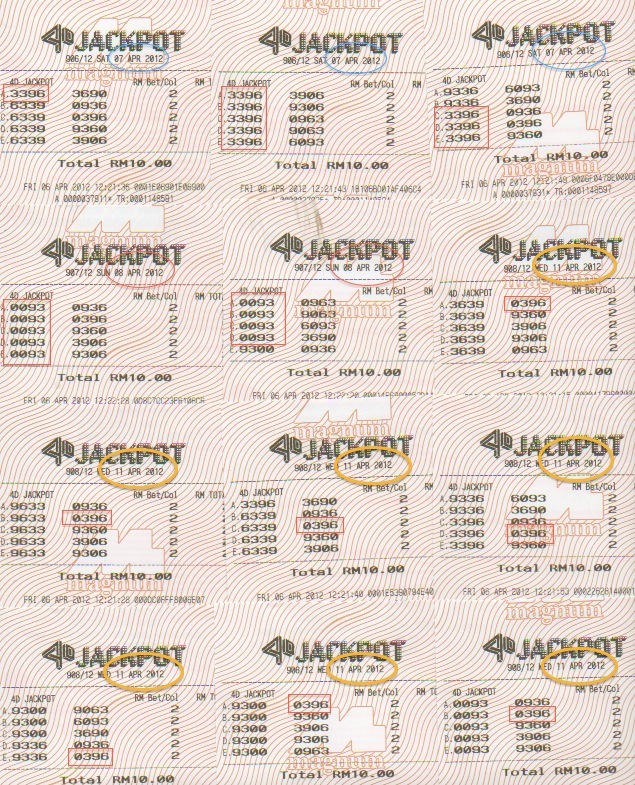 Below are the Malaysia Magnum Jackpot game that we pool together to play with 3 peoples. I selected 1 set of ABCD and 2 set of AABC. From the ABCD, I pick 9 direct numbers, from the two AABC, I maximum pick only 7 direct numbers, 5 from 1 set, 2 from the other set. Therefore, the play for each draw is only 9 x 7 x RM2 = RM126. Look at the date of the tickets below, it proved that playing with proper planing and selected numbers can yield positive return. We are starting a new session of pooling on 21 April 2012, if you want to join us in the winning, drop us an email or call us at +6592300837. We can explain to you on the terms and conditions to join.